Our Latest Album hitting the shelves on Thursday, 8 August 2013! Gage was formed in 2007 by ex-drummer Jason Horseman o f SAMA award winning indie rock band Sunways. 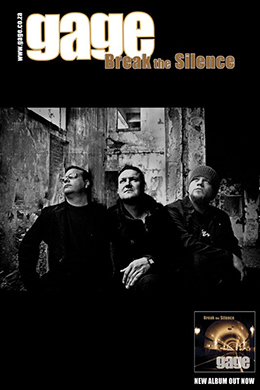 GAGE released their first album in 2010 titled ‘Empty Spaces’ and will be releasing their 2nd album titled ‘Break the Silence’ in the next few weeks through Sting Music. The album boasts 11 superior rock songs suited to everyone’s mood as it will take them on a musical journey from a slow relaxed vibe to a high tempo adrenaline rush. The lyrics are candid and eloquent and I know that everyone will be able to relate to this raw emotional presence in every track. The album was produced at The O studio in JHB by super talented Theo Janse van Rensburg, one of SA’s top session guitarists! Theo also played bass & guitar on the album and performed all the additional programming. The title track ‘Break the Silence’ is about the awkward silence that exists between two people that are having an argument and one of them needs to break the silence to make peace. I wrote ‘Bend or Break’ for my baby boy Ethan Tyler. Becoming a father has been the most rewarding and humbling experience ever. The song is based on the fact that no matter what, I’ll always believe in him and be there for him. ‘Please’ was written during a difficult period in my life when I craved positive reinforcement and felt broken down by the negativity surrounding me and lack of emotional support. ‘My Song’was written for my fiance that I have had a crush on for more than ten years. She was forever on my case about writing my own songs! The rest of the tracks are all based on my personal growth and all the emotions felt in my relationship. I am one of the lucky few that can burst into song when my emotions overwhelm my cognitive thinking!